My favorite member of Brian Eno’s ambient series has always been Ambient 2. Ambient 2: The Plateaux of Mirror is an utterly beautiful record that showcases the brilliant talent of two already seminal artists. Released in 1980, the record came at a time when both Budd and Eno were pioneering ambient methodology. Harold Budd is one of the twentieth century’s most recognizable pianists, not through technical skill but his distinctive minimalist style. Brian Eno always innovates at every step of his career, and he excels in producing just as much as music making. In Ambient 2, the dream team was assembled and an album of airy, minimalistic beauty was crafted. Ambient 2 is an album that carries a shocking amount of emotion with very little sound. Only simple, delicate piano chords are in the music, permeated by Eno’s excellent production. Ambient 2 really is the best ambient album of it’s kind. It’s the kind of album that is engaging when you want it to be, and discreet when you want it to be in the background. You can have just as much fun listening carefully as falling asleep on your couch when it is playing. Four years later, Budd and Eno decided to collaborate again and release an album in the vein of it’s predecessor. The Pearl is very similar to Plateaux. Enough so that it could be considered a direct sequel. While Budd has a very distinctive style, Eno has always been about changing and developing his own style, making The Pearl a rare case, something familiar. So if you are not into minimalistic piano music, or ambient music, then this is not for you. But if you liked Ambient 2, then this record is completely triumphant. Ambient 2 left listeners begging for more, and The Pearl delivered the goods, and then some. The Pearl is more delicate, relaxing, better produced, and memorable. Budd has opted for a more varied approach here. Ambient 2 was essentially full of happy, momentous ambient music that did not challenge the listener much. The Pearl has some vaguely dark moments. In songs such as Dark Eyed-Sister and Foreshadowed, the mood is slightly melancholy and mysterious. This is good because, these moments seem to make the album more realistic and engaging. There are also some songs where Budd makes some of his chords dissonant and even accidental, namely The Silver Ball and The Pearl. When he does this, those chords mixed with the subtlety of the music makes for a kind of mystery that is biting, and yet somehow searches for no resolution in the ears. Even when he hits an odd chord, the music is soft, and there is no shock here. It’s that production, though, that cements the bond between the listener and the artists. The album is better produced than Ambient 2, which already had fantastic production. While Harold Budd’s piano sounds very bare and natural on Ambient 2, it sounds more softer, more produced here. His playing is just as strong, but easier on the ears. 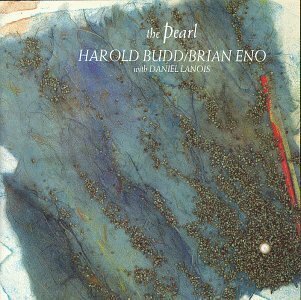 Eno and accompanying producer David Lanois are just as important as Harold Budd, who is obviously center stage. While Budd is the backbone and the real draw of the music, Eno and Lanois create the atmosphere with a backdrop of ambient sound that makes even the melancholy numbers feel warm and enveloping. This record is truly a safe place to let your mind wander. Always relaxing, even when it is stimulating. The first time I listened to this album, I was blown away. I can think of very few other albums that I felt the same love for on the first listen, mostly unanimously great records such as Loveless, OK Computer, and maybe Siamese Dream. That’s all obvious stuff. I was skeptical about The Pearl and I was completely enthralled from the beginning. Upon turning on the album, it seemed to end far faster than it should have despite it’s regular length. And I could not deny that everything I just heard was amazing. Great ambient record. exacly, I feel i think this same, this one of my fav. albums, It’s so high like ok computer, of loveless…. maybe I know Lovely thunder?